It's back to school time for Thad. Please buy him a Trapper Keeper. Our friends at Hydra Head records are encouraging people to vote. Or, more specifically, they are rewarding their core constituency (and keep reading, because we may be talking about you): the crucial "eligible for a vote but feel that someone should pay them to do it" crowd. The good news for them is that Hydra Head is ready be that someone. If you get more excited about things like test pressings and swirly vinyl than you do about exercising political power, then this if for you. In short, the label is giving away a bunch of stuff to encourage people to register to vote. This is something we can endorse. 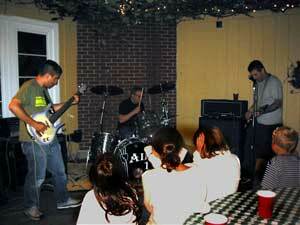 "We played a cookout in Libertyville that was hosted by a coworker of Tony's. When we got there we thought there was NO WAY we were actually going to be allowed to play. "The suburban yard was filled with kids and neighbors from the ages of 3 to about 75 and we were to set up on an outdoor patio facing a park in a very suburban, family-oriented neighborhood." They played to a motley group of mercilessly stone-faced ten year olds and other cookout-types. We hope that all of you who don't play easy listening music can appreciate this. You spend hours and hours practicing and honing your music, finally ready to bring it out for the world to enjoy. But it happens very different than you thought it would. As you're passionately pounding away and trying to get it right, you look up to see some kid in a Sponge Bob t-shirt who has no idea of how to think about you. Fate is a cruel mistress. Those kids in the front row seem to be having a hard time of it.